Born in Los Angeles in September 1921 and still going strong and working at 87, Chico Hamilton has three complete classic albums featured on the next addition to the growing AVID Jazz catalogue. Chico Hamilton Quintet featuring Buddy Collette recorded in 1955 kicks the set off and introduces the world to the unique sound of drums, sax, bass, cello and guitar. Chico Hamilton Quintet In Hi Fi repeats the successful formula with the same group, Chico on drums, of course, Collette on sax, Jim Hall, guitar, Fred Katz, cello and Carson Smith on bass. For our third album Chico Hamilton Quintet Paul Horn replaces Collette and John Pisano replaces Hall on guitar. 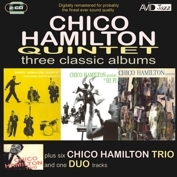 Rounding off proceedings we include selections from the album Chico Hamilton Trio featuring George Duvivier on bass and Howard Roberts on guitar. All the tracks have been digitally re-mastered for probably the finest sound quality ever!